Actress, and writer, Tina Fey writes her memoir with a little whining and humor. 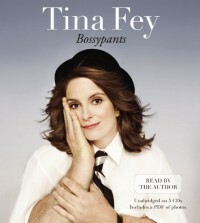 I loved Tina Fey on Saturday Night Live and have been a fan of her movies, so I was eager to listen to this audiobook. Listening to Fey talk about her childhood and knowing where she is at now in her life, seems to me that her life has gone in the direction she was meant to be in. As funny as Tina Fey is as a actress, I found this book to be funny but not laugh out loud funny. Although I was listening to the audio and my hubby was listening as well. He did laugh out loud quite a few times. So maybe something is wrong with me and/or I wasn’t fully listening. I was looking for the laugh out loud but for me it just was not there. Although I could not relate to many things that Fey has been through, I still enjoy her as an artist in whatever field she may proceed in. If you like Tina Fey and enjoyed 30 Rock (I did not) you will probably enjoy this more.